I'm not sure how I learned about this stationery, but I found out about it before the release date and was actually eagerly anticipating its availability. Presenting Unicorn Wishes! from Chronicle Books. Unicorns + rainbows = nostalgic kitsch & happyland for me. 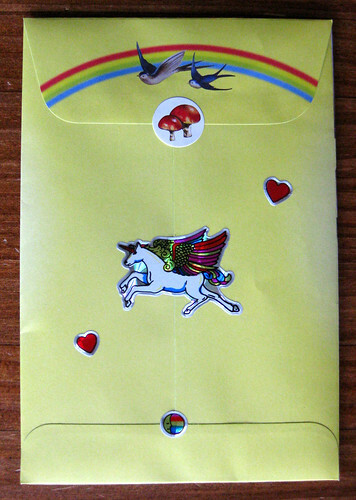 Only the little mushroom sticker on the back of the envelope came with the set; the sparkly hearts and combo unicorn/rainbow pegasus (wtf?) came from my own private collection. I think they add a whole new level of cornification here. Again the Chronicle Books website rather fails us, because you only get to see the back of ONE of the lovely stationery sheets (shown on the Unicorn Wishes! page here). I should photograph this in more depth soon - it is full of splendid wonders. 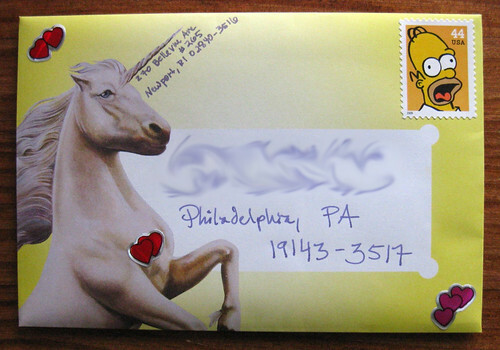 Who knows - maybe YOU'LL get a unicorn wish in your mailbox. I don't know what it is about the juxtaposition of Homer Simpson and a very serious unicorn, but it made me laugh out loud. Oh good! That effect was quite intentional. oooooh my god unicorns. i wish i would get letters like that! 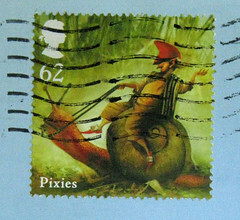 do you receive postcards as well, or is that kind of against the point? Hi Enna, I enjoy postcards very much and send them, too. I usually respond "in kind," meaning if I receive a postcard, I send a postcard, receive a letter, send a letter, etc. WHAAAAAT? This is Chronicle Books doing this? Gravy! What an opportunity!